J Morgan Slade, CEO CloudQuant. Grace: Going back to what you are doing now with CloudQuant, I understand that you have a trading strategy incubator where your team has the experience, the technology, the capital and allows algo traders to essentially get a strategy funded. Can you tell us more about that and the vision behind it? We started building CloudQuant in 2011 and we recognized that there were inefficiencies in the market and hundreds of traders were looking for these [inefficiencies] but many of them did not have the solid skillset to search for alpha opportunities in a scalable way. We did have a core team of quants that continued to use CloudQuant internally to run a quantitative fund and we had good success with that. As an extension, the reason we built this trading and research ecosystem was ultimately to offer to crowd researchers so that we could level the playing field so that engineers or data scientists or professionals anywhere in the world would have the ability to gain access to institutional quality research tools. Now we think that the trade execution ironically, although it’s made with algorithms, is something that’s very difficult to understand for people who are not native to the financial industry. So we actually draw the line at taking care of the operation of the trade and the compliance and risk management ourselves and we simply leave the strategies to crowd researchers. We are taking those four things [machine learning, alternative datasets, cloud computing, and crowdsourcing] that we bring together as ingredients to this very special recipe that is powerful and will ultimately allow us to generate alpha at scale for the first time. A comprehensive and practical guide to the stock market from a successful fund manager—filled with case studies, important background information, and all the tools you’ll need to become a stock market genius. CloudQuant Thoughts: Neural networks were decades away when Hinton started. He said, “If you want to understand a really complicated device, you should build one.” Today we all are benefiting from his groundbreaking work. This video is only 5 minutes long. As Nvidia Corp. (NVDA – Get Report) looks to markets beyond gaming computers for its powerful graphic processing units, the company is putting its cash to work in a range of artificial intelligence startups. The chipmaker’s Nvidia GPU Ventures unit announced investments in data-crunching technology developer BlazingDB, data visualization company Graphistry and artificial intelligence platform developer H2O.ai, on Thursday. CloudQuant Thoughts: In my prior job at Neurensic the technology stack included H2O.ai. It worked well as a machine learning tool to train trade surveillance models. Seeing these technologies merged sounds very impressive. Richardson would like for her team’s work to help inform the discussion. CloudQuant Thoughts: We like the practical application of AI for making sound personal decisions too. Emotions in buying a house run high. Realtors, who are compensated on the house you buy, not your financial and life successes may not be your best tool. AI and machine learning can help you make your best decision. First he spoke in English. Then he switched to Mandarin Chinese. Mr. Trump doesn’t speak Chinese. The video was a publicity stunt, designed to show off the voice capabilities of iFlyTek, a Chinese artificial intelligence company with both innovative technology and troubling ties to Chinese state security. IFlyTek has said its technology can monitor a car full of people or a crowded room, identify a targeted individual’s voice and record everything that person says. CloudQuant Thoughts: Sounds like the application of AI will help all of us communicate. Maybe we are finally getting closer to having that “Star Trek universal communicator” I saw on TV when I was a kid. Can artificial intelligence diagnose and cure diseases? …nters to bear such a mindset is that there has been a massive shift to a value-based reimbursement model recently which is being ushered in with nothing but the Affordable Care Act. So, if I say that Artificial Intelligence is going to take the healthcare industry to another level then it wouldn’t be wrong at all. Isn’t it? Well, below are some of the significant ways through which artificial intelligence is creating such a remarkable difference in curing diseases. Just have a look! CloudQuant Thoughts: We like the practical application of AI in the field of medicine. It is our hope that innovation will help drive the accessibility and affordability down for all while at the same time improving the quality. We also like that innovation in applied AI for medical makes some great opportunities for investing. 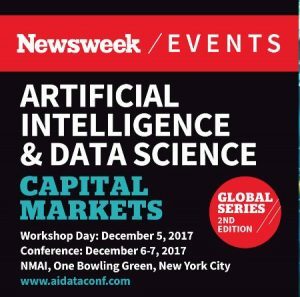 CloudQuant will be participating in the Newsweek conference on #AI and #DataScience. for the Capital Markets Industry on December 5th to December 7th, 2017 in New York. This conference will cover the abundance of cheap and powerful computing capacity is bringing artificial intelligence to bear on an ocean of data, across a range of industrial applications. For CloudQuant this includes tools including Python programming language, Jupyter Notebooks, SciKit-Learn, Technical Analysis Library TA-Lib, and our own CloudQuant are making it easier for anyone to enter the world of algorithmic trading. Improved access to information is also making it easier for the world to reach into the world of data science applied to trading and data science. StockTwits, Alexandria Technologies, Twitter, LinkedIn, Reddit, Quora, and more are all publishing insights into the world. Individuals, both professional and personal, are publishing more insights into the world. Google, Bing, Benzinga, Newsweek, Bloomberg, Reuters, and others are all making it easy to find relevant, high-value data that previously were not easily available. YouTube, LinkedIn, Quora, SMB Training, QuantInsti and others are all teaching anyone interested in trading and algorithm insights that 5 years ago were not available to anyone other than a select privileged few at well-capitalized trading firms. CloudQuant is finding that it isn’t just professional money managers that are exploring these new techniques. We have users from over 130 countries that are interested in these techniques. We hope you will join Newsweek at their event to join the discussion and exploration of Data Science and Algo Trading. …investment ideas to hedge funds, asset managers, asset allocators, pension funds and wealth managers. Their investment expertise, combined with high-quality data, proprietary algorithms and AI driven machine learning models helps investors make sense of complex trading environments and make better investment decisions. It is important for Optima to be knowledgeable of the changes in strategies and tactics being used by portfolio managers and to be at the leading edge of technology. Especially as artificial intelligence is used more and more in enhancing hedge fund research and trading efficiencies. There are, according to Gimbel, five pillars to Optima’s operation. The first is high quality control in everything it does, primarily with respect to the research process and the people it works with. Second is risk management. CloudQuant Thoughts: Finding ways to trade using AI is a game changer. We are finding success with it. But innovation and AI doesn’t stop there. Morgan, our CEO has set out a group of binders that are on the conference table near me. They have thousands of pages of techniques for evaluating trading strategies. Not only should our industry be using AI for trading, we should also be using it in our daily jobs which include risk management, investment evaluations, and more. Can a digital lender be more than purely an efficient lender? CloudQuant Thoughts: The sensationalism of saying something like “15% of the global workforce may need to switch jobs” always alarms us. In reality, all jobs change. I started programming in college using Fortran and COBOL. Every job that I have had has required me to change and learn new tools, techniques, and ways of doing things. Change is inevitable. If it isn’t AI it will be something else. Therefore I believe that becoming a lifelong learner embracing change is a good thing. Otherwise one should go back to using a rotary phone!